The Blue Technologies Group’s Ulysses 1.1 is not a word processor, an outliner, or a text editor, but it incorporates aspects of each of these into its streamlined writing environment. 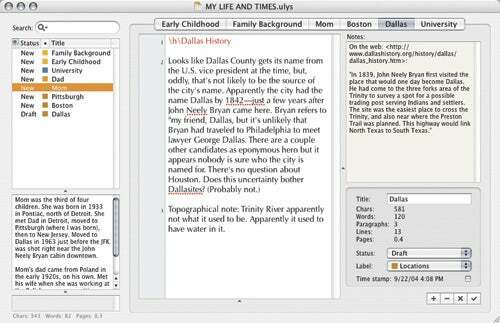 While Blue Technologies describes Ulysses as a tool for creative writers, it will appeal to other types of writers as well. Ulysses’ multipaned window makes comparison and organization extraordinarily easy. In Ulysses’ one-window interface, you work on a project that consists of many documents. Ulysses’ project window has many panes; each gives you access to an aspect of the project: there’s a list of documents, the document editor, a versatile area for writing notes and storing images, a pane that displays a document’s word count and other information, and panes that show another document’s text and notes, for quick comparison. You can switch from one open document to another via OS X-style tabs. Reorganizing documents is a simple matter of dragging their names in the list. Ulysses is great for brainstorming. If you have a flash of inspiration, just press Command-N and start typing. You can figure out where to put the new document later. This lets you focus on what you want to say rather than how it’s going to look. (Ulysses’ few formatting options are limited to font size, text color, and background color.) The program’s Fullscreen mode provides a view of your primary document without the distractions of the other windows or the application’s menu bar—there’s nothing left on screen but your words. Ulysses has no import command, but you can drag and drop HTML, Word, and RTF files onto the application icon (or an alias of the app). This creates a new Ulysses project. If a project is already open, Ulysses imports the text into a new document in the current project. If you paste text from Microsoft Word, however, all formatting is lost. When the parts of a project finally gel, Ulysses’ excellent export options allow you to save what you’ve written to another file (plain-text, RTF, or LaTeX) that can be formatted for presentation in a word processor. Within the document editor, you can mark three types of paragraphs (section titles, comments, and block quotations) for formatting after exporting to RTF. For example, I drafted an article in Ulysses, exported it to RTF, and then formatted it in Word. I exported from the Ulysses project only the documents I wanted to use in my finished article. Actual notes, as well as documents created for research or brainstorming, I left in Ulysses for reference. My main complaint about Ulysses is that all a project’s documents are at the same hierarchical level and cannot be separated into folders. This makes organization cumbersome, and if you have more than 30 or 40 documents, you’ll spend some time scrolling through them. In addition, the relationship between saving documents and saving projects, and how the Revert To Saved command works with each, is confusing. You can’t close a document in a project window without saving it, which makes sense. You can, however, close a project without saving all its documents, which doesn’t quite make sense. Fortunately, when you do this, no changes to unsaved documents are lost, because the documents are saved in a cache. If your writing process includes free-form note-taking and does not follow a straight line or a preordained structure, Ulysses 1.1 is an excellent writing environment. It’s a snap to use, and its interface is conducive to brainstorming. But if your project will require extensive formatting, using a word processor from start to finish may make more sense.